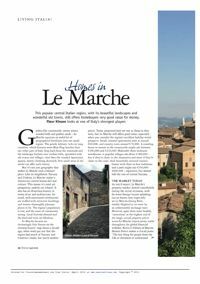 Below are some articles about the Le Marche region. 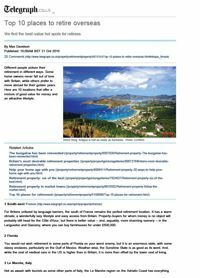 It is regularly featured as one of the most favoured regions in Italy in which to buy a home or to live permanently. Click on an article to read it.
" We purchased a holiday home in Le Marche in April 2016 through Magic Marche. Richard and Jane were fantastic throughout, their knowledge of the area, the buying process, hints and tips were invaluable. They also provided support on setting up bank accounts, utilities, introduced us to local people who could take care of the house & garden (now friends!) and generally went above and beyond to help us buy our (dream!) home from home. " " We had been looking for property in Italy for some time, viewing many properties with many agents. Originally looking for a business opportunity, we then decided to find a smaller property as a base. Jane and Richard had a little town house on the market that fitted the bill. From the time we agreed to purchase, they have helped us at every stage. They helped with opening Bank accounts and arranging Italian tax codes, made contact with all the service providers including Gas, Water, Electric and the Commune. It could not have been an easier process. In addition Richard is on site helping with the works that are needed to be made to the property while we are back in the UK. We would recommend them to anyone. " " Our current house is the second we have bought in the wonderful Le Marche region and Richard and Jane handled the transaction with the calm efficiency of seasoned and experienced professionals. Magic Marche is very much a team operation with Richard organising the negotiations and Jane masterfully handling the details and mechanics of the sale and purchase. This latter can be quite fraught in the Italian system but liaison with lawyers, utility companies and purchasers was handled beautifully. I highly recommend property ownership in le Marche, and indeed using Magic Marche. " " When I bought my house in 2014 I was apprehensive about the Italian house purchase system. With Jane and Richard from Magic Marche guiding me through the process it was reduced to easy steps towards a successful outcome. They had specialists on hand for every turn and we exchanged contracts with the sellers without any hitches; in fact the system in the U.K. looked labyrinthine by comparison. However the involvement of Magic Marche does not stop once they have made a successful sale. They have subsequently guided me through the planning application process with the comune using their architect and engineer, found tradesmen for maintenance tasks and even put me in touch with a Financial Planner in Rome. If you buy a house with Magic Marche you are not getting just a real estate agent but an on-going commitment to ensuring you make the most of the property and a most delightful team who will turn into friends. " " We were interested in buying a holiday home in Italy and contacted Magic Marche prior to a holiday we had planned in Le Marche, to assist and arrange some viewings while we were there. Jane and Richard were a great help from the moment we contacted them. They helped us shortlist a selection of properties and also provided very useful information about the Le Marche region in advance of our visit. During our trip, they arranged a series of viewings and accompanied us while we visited all the properties. Their help during and after the trip was invaluable, assisting us in negotiating the sale and with all the arrangements and paperwork for the purchase. They provided us with a whole range of practical advice related to buying and owning our house in Le Marche. We now have a beautiful holiday home in a great location in Le Marche. It is a wonderful region, with fabulous scenery and a relaxed way of life. We would wholeheartedly recommend Magic Marche to anyone interested in buying property in the region. " 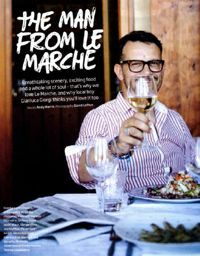 " We decided on Le Marche for our permanent home about three years ago, and started house hunting at that stage. We quickly came to realize that Magic Marche offered us the best chance of achieving our goals. From the start, we had the impression that they wanted us to find our dream home, and were infinitely patient. Jane is charming and very efficient. She helped to arranged five trips for us to Le Marche. On each occasion, we were met and escorted to view properties that might have been of interest by a knowledgeable member of the Magic Marche team. We were always made to feel that there were no time pressures, and all our queries were answered honestly and with local understanding. On the fifth visit, Giorgio took us to our perfect project. A large country house for restoration, with an extraordinarily beautiful parco, all fallen into disrepair. The purchase process was very complex. However Jane found us a superb advocate, who conducted negotiations skillfully and introduced us to an excellent geometra to help with the restoration project. Giorgio continued to give us great support and has become a firm friend. Although only at the start of the restoration, we unreservedly recommend Magic Marche for their thoughtful help in finding and purchasing property in Le Marche, and for helping us to make contacts during the purchase and restoration phases. "